Kecia Rust is the Executive Director and founder of the Centre for Affordable Housing Finance in Africa (CAHF). In this issue of the Global Housing Watch newsletter, Rust talks about CAHF’s latest report on Housing Finance in Africa—2017 Yearbook. Hites Ahir: CAHF tracks house prices in Africa by looking at the cost of the cheapest house that is been built by a private developer, and the size of that house. This has been done for the past 8 years. Are there any emerging trends? Kecia Rust: We collect this data from local housing experts in the countries included in our yearbook. To clarify: this is not the cheapest house that can be built, but rather the cheapest house that the expert understands has been built in the past year. It reflects the state of the market: where developers are operating, and what is available. Unfortunately, we can’t see clear trends – this is partly to do with the fact that in most countries, housing developments are haphazard, once-off interventions, rather than part of a sustainable ongoing construction sector. Investors struggle to find viable projects, or developers with sufficient capacity to meet their investment terms, so the projects that do go ahead are often a result of exceptional and focused effort, rather than healthy market growth. Housing costs are not coming down across the board, but they do vary year to year. In Djibouti, for example, the cheapest developer-built house in 2016 was about US$140,000; in 2017, it was half that, at US$76,300. In Ghana, the cheapest developer-built house in 2016 was much lower, at US$20,223 than it was in 2017, at US$55,211. These numbers are not comparable – they reflect a haphazard development process in which, at a macro level, has not achieved the efficiencies that come with a moving and sustainable construction sector. Hites Ahir: CAHF’s new report notes that there is an increasing interest from investors, but the focus continues to be on higher value housing. Why is this the case? Kecia Rust: There are probably two main reasons that drive investor focus on higher value housing. The first reason is obvious: higher value housing can accommodate wider margins that can then absorb some of the risk that comes with housing development. The breadth of challenges along the housing delivery value chain are unpredictable and vary from one context to another. A municipality may promise to have infrastructure capacity for a development, only to renege three years down the line, or the rights to the land may be challenged or delayed. And what you might be able to predict for Uganda is entirely different in Angola. Local context matters. To provide for the risk that these challenges will occur, developers build a wider margin into their project costings, and target a higher income buyer who likely to be less price-sensitive. The second reason is harder to quantify and address, but I think it is more significant. It has to do with vision, and what investors, developers and policy makers, not to mention households themselves, imagine an affordable house to be. Developers and investors want to show that they can build a quality product, but this is often expressed in size and level of finish – and the cost of the square meters adds up. They also want to show that their housing sits within sustainable human settlements, with schools, clinics, parks – all the amenities. Because the capacity of most local governments is constrained, however, this becomes part of the development itself, adding substantially to the cost. At the same time, lower income borrowers who can contemplate the long-term payment obligations associated with a mortgage are unimpressed with the housing they might actually afford. Everyone is looking for three bedroomed houses with en-suite bathrooms and large stands. Hites Ahir: The report points out that one of the characteristics of Africa’s housing market is poor targeting and insufficient scale. Could you elaborate on this point? Kecia Rust: Yes. Angola’s national housing programme was established to build a million affordable housing units – and yet the cheapest unit in its flagship project in Kilamba, just outside of Luanda, was originally priced at US$120,000 (this was later reduced to US$84,200 US dollars). In Rwanda, the Social Security Board funded the development Vision City in Kigali, where the cheapest unit was US$124,000. In both cases, these houses were affordable to less than 1 percent of the urban population. Even with an intention for being affordable, these scale projects produced houses that were far out of reach of their supposed target market. The consequence of this disconnect is that in many cases, the projects don’t sell. In Vision City, initial occupancy of the first phase sat at about 30 percent, and many of the houses were bought with cash, by investors rather than residents. When sales didn’t pick up, prices were reduced by a third. Prices in Kilamba were reduced by 44 percent, and the government also offered a subsidized interest rate on the mortgages. Meanwhile, the examples of truly affordable housing that we do see are at nowhere near the scale required to meet the latent demand and achieve the economies that will make the effort worthwhile for investors. Individual projects of 400 units here, another 1,000 units there, offer interesting case studies, but fail to grow past pilot phase. We need thousands of projects of affordable housing across the continent. In our Yearbook, we argue that the challenge is to mainstream the US$7,500 house so that all developers focus on this opportunity. Indeed, a back-of-the-envelope calculation suggests that given current financing arrangements and the incomes, there could be a latent demand of upwards of 52 million units. What would it look like if we were to actually make that happen? Hites Ahir: CAHF has collected data on policies and laws relating to finance, titles and tenure, infrastructure, construction, land, sales and transfer. What have you learned from this data? Kecia Rust: We have built a dashboard that lists all the relevant policies and laws that we can find, for each country. It’s just a start – we have found a total of 254 across the continent – but by itself, offers interesting insights. The most obvious finding is how few countries have recent, enacted housing policies. We have found housing policies in only 12 countries, and only five of these (Rwanda, Ghana, Uganda, Mozambique, South Africa) are younger than ten years. In many cases, while we have found mention of a document, we can’t access it on the internet. There are certainly many more policies and laws that we haven’t found – but this too is instructive. Our struggle in accessing the documents suggests that when investors prepare to invest in a country they are also unable to easily establish the regulatory framework that governs their activities. Hites Ahir: In the report, you have also looked at how the housing market varies across the different regions in Africa—Central Africa, East Africa, North Africa, Southern Africa, and West Africa. Can you tell us and show us how affordability compares at the aggregate level (Africa) and regional levels? Kecia Rust: Housing affordability is a function of three things: household income, the price of the house, and the financing terms. While each of these vary from one country to another, we can see regional trends. In North Africa, incomes are higher and mortgage rates are lower – all below 10 percent and as low as 5 percent in Egypt – and so housing affordability is higher. In Algeria, just over a third of the urban population could afford to buy the cheapest house currently being developed at US$25,400. In Libya, more than half the urban population (59 percent) could afford a US$50,000 house. With lowish interest rates for the region, the challenge is the price of the house: virtually all urban households would be able to afford a US$7,500 house, if that were available. 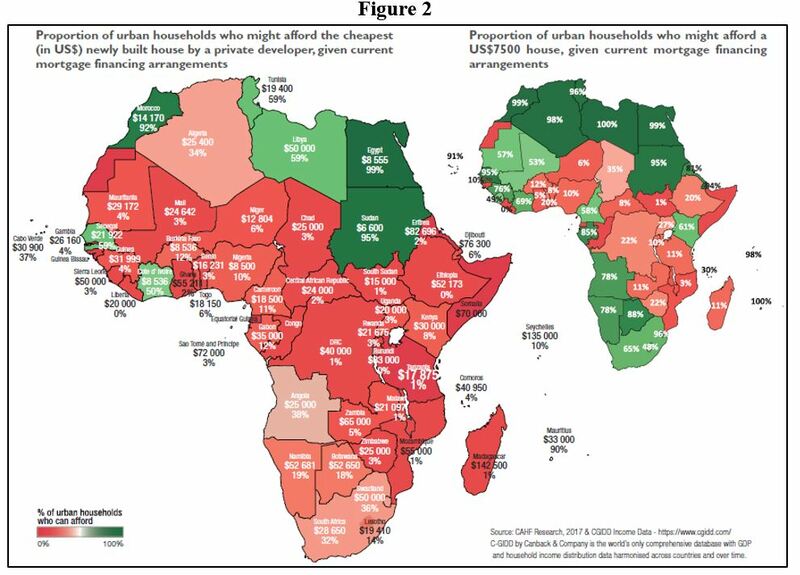 Affordability is most constrained in East Africa, where mortgage rates are mostly above 15 percent. Interest rates in Uganda are 19 percent; they are 18 percent in Tanzania and 16.8 percent in Rwanda. Urbanisation rates are very high as the region shifts from being predominantly rural, and household incomes are low. The cheapest developer-built house in Kenya, at US$30,000, would be affordable to only 8 percent of the urban population. Reducing that house cost to US$7,500 house does increase affordability – but still only to two thirds of Kenya’s urban households. The cost and availability of finance also makes a difference. In Southern Africa, mortgage rates range substantially, from 7.5 percent in Seychelles and 8 percent in Swaziland, to 25 percent in Mozambique, and 34 percent in Malawi. Urban incomes are generally higher than rural incomes, but still relatively low, so that the vast majority of urban households cannot afford the cheapest developer built house in their country. Even in South Africa, where the housing sector is functioning relatively well, only 32 percent of urban households can afford a US$28,650 house. Interest rates and income distribution in West and Central Africa vary considerably, so that in Senegal, where the interest rate is 6 percent, the cheapest developer built house, at US$21,922, is affordable to 59 percent of the urban population. Although Cameroon’s house is cheaper, at US$18,500, the 18.5 percent interest rate, and income distribution that applies makes it affordable to only 11 percent of the urban population. Hites Ahir: What is the housing market outlook for next year? Kecia Rust: Increasingly, governments and housing sector players, are beginning to take note of the challenge of affordability. There is an energy around affordable solutions – from the focus of the Abuja Housing Show to the papers presented at the African Union for Housing Finance annual conference, to Shelter Afrique’s 5,000 for 5,000 challenge. I’m not sure this will translate into a concerted shift in the next 12 months, but certainly market attention is beginning to shift towards where the demand actually is, rather than on where we would like it to be. 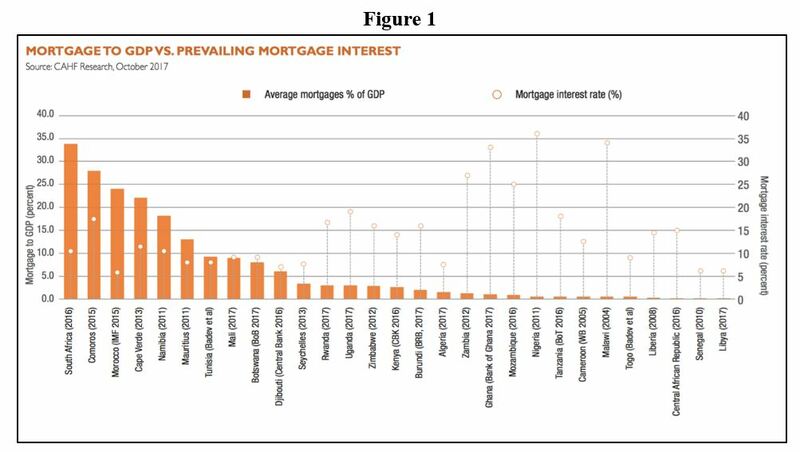 Kenya’s recent announcements in favour of affordable housing and the role of Savings and Credit Cooperatives (SACCOs) is interesting, and the World Bank’s consideration of a liquidity facility aimed at SACCOs and their provision of end user housing credit is worth watching. Investors are also considering how they might reframe their approach. Regulatory jurisdictions in Rwanda, Uganda, Kenya, Tanzania, Nigeria, South Africa and elsewhere, are making it possible to consider the potential of Real Estate Investment Trusts to enable affordable housing. As we get better at quantifying and framing the problem, we can better target our efforts on the real opportunity. A potential for 52 million units at US$7,500 each is not something to disregard. In our report, we argue that if we imagined this as a 10-year delivery programme of 5 million houses per annum across the continent, we could stimulate almost US$40 billion of direct economic impact annually. This could unleash US$22 billion in direct upstream economic activity (80 percent of which would likely be in manufacturing), and US$18 billion in construction sector economic value added, per annum. Labour remuneration of US$6.6 billion per annum would stimulate and sustain over 1,3 million jobs in Africa’s economies, in the construction sector alone. Certainly, that’s something to contemplate with a bit more than just the back of an envelope.